You will learn proven practical techniques by masters. What is the secret of the world’s most successful life coaches? They have a variety of powerful strategies at their disposal to create effective, lasting changes in people’s lives. Professional coaches stay in touch with their clients, their needs and their real-life problems. People change and so does the way they experience challenges, difficult situations and problems. 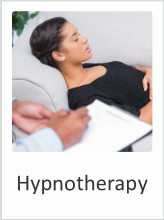 To help real people with real problems, you, as a professional life coach must have the latest tools and techniques. Because we are active practicing coaches and master trainers we continually adapt and transform the course content to equip you with the latest industry trends and practical techniques. Our experience showed that the solutions that we applied 10 years ago are no longer as effective as it used to be. 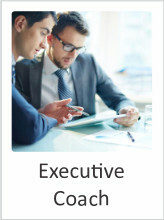 As in any industry to have the competitive edge you require the latest approach, techniques, and processes. 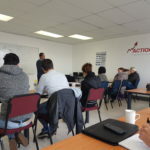 The secret to Action Factory courses is the modernization of our training and course material according to current trends and needs. The Life Coach element of the training focuses on creating action and motion to ensure your client achieves a balanced goal orientated life. 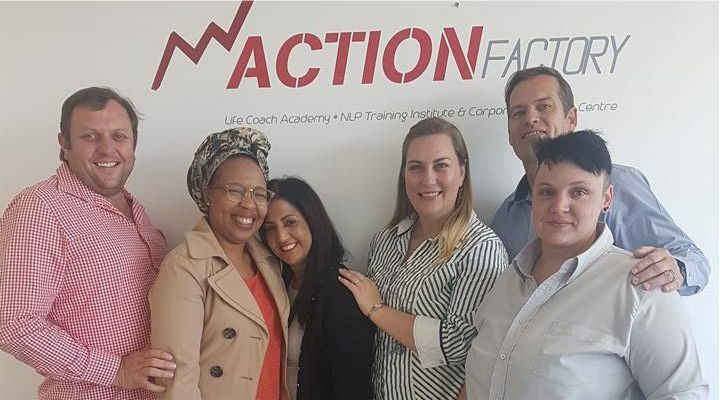 The NLP element assist with removing fears, phobias and limiting beliefs and replacing them with empowering subconscious thought patterns that brings about true change in our lives and that of our clients. The complimentary disciplines of Life Coaching and NLP is extremely powerful in unlocking the true potential in yourself and your clients. Our training is designed to revolutionize our student’s thought patterns. You will learn skills and techniques to effectively create long lasting improvement to your life and be able to create positive change in others. The tools and techniques you will learn will provide you with a real edge to bring about positive change. At this course participants will learn how to apply Life Coaching and NLP effectively. 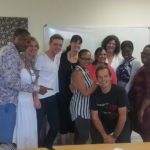 You will be taught to become an NLP Practitioner and a Life Coach. It is 2 courses/skill sets that have been combined into 1 powerful course. Here is our course schedule. The Combined NLP Life coach certificate is designed to install a new “frame of mind”. You will have a clear understanding on the basic functionality of how the mind works. You will be trained by an Internationally Certified Master and Trainers in NLP and Life Coaching. The subjects are taught individually yet the skills are integrated for high performance and efficiency. 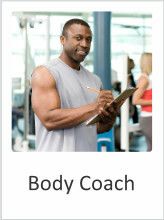 This course is designed to install skills and techniques. NLP is acclaimed for its “magic” techniques. NLP is widely used to support a variety of psychological behaviors. Many of us live with fears, phobias, limiting beliefs, unwanted programs and obsessive behaviours which we wish we could change. With NLP you can. We teach a wide range of personal change techniques so no person any longer has to ‘live with’ the problem. Do you want to bring about positive change or a new “frame of mind” in others? 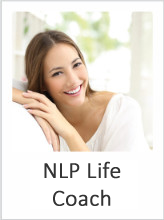 This course is designed to equip you with the required skills and techniques to become a Professional NLP Life Coach. So many more people are now seeking NLP Coaching because it offers them an opportunity to create real lasting change into their lives. This includes individuals, business, and professionals searching for specific guidance and support. At its basic level, NLP Coaching is about helping someone move from where they are to where they want to get to. Should you prefer not to take the once off payment method you may pay the course over a period of time. By clicking on the link you will be paying a deposit of R 3300.00 immediately and R 875 over 12 months. You can use this option via your debit or credit card. Once you have completed the payment option, please forward an email to bookings@actionfactory.co.za to secure the dates and venue that suites you.